Governor General Sir Arthur Foulkes welcomes Pastor Jonathan McKnight and United States Congresswoman Corrine Brown (Democrat from Florida) to Government House on Friday, August 6. They are in New Providence attending a religious conference Friday. 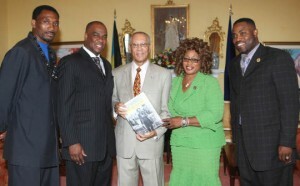 Governor General Sir Arthur Foulkes is presented with a book (Black Americans in Congress 1870-2007) by United States Congresswoman Corrine Brown, from Florida’s 3rd congressional district, during a courtesy call at Government House on Friday, August 6. Also pictured are Pastor Arthur Duncombe, Pastor Jonathan McKnight and Bishop Trevor Williamson. The book was not written by Ms Brown or either of the pastors. It was created by the US government and is available in its entirety online. The most comprehensive history available on the 121 African Americans who have served in Congress. ZIP format: You may need WinZip installed on your computer to unzip a ZIP file. However, the files have also been broken into sections below for convenience. All files are available in PDF format. You will need Adobe Reader installed on your computer to view PDF files.